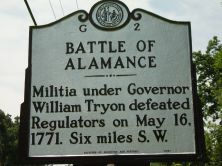 Militia under Governor William Tryon defeated Regulators on May 16, 1771. Six miles S.W. 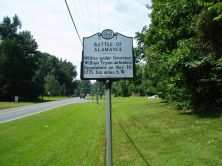 At a site six miles southwest was fought on May 16, 1771, the Battle of Alamance. Opposing forces were Colonial Militia, mainly from the eastern part of the province, commanded by Governor William Tryon, and a band of frontier dwellers known as Regulators, who had risen in arms against corrupt practices in local government. On May 14 Tryon’s force of 1,100 men, arriving in the heart of Regulator country to subdue these uprisings, made camp on Alamance Creek. Already some 2,000 Regulators, armed with old muskets and makeshift weapons, had come together five miles southwest of Tryon’s position. Messages were exchanged between the camps, the Governor demanding immediate and complete surrender of the Regulators and the Regulators petitioning the Governor for reforms. Nothing came of the negotiations and on the morning of May 16 Tryon ordered his force to march. His route led along the old Hillsborough-Salisbury road which connected the two camps. After marching about three miles, Tryon halted the militia and ordered a practice battle formation. After this maneuver the force re-formed in marching column and continued down the road. At ten o’clock Tryon’s men arrived within half a mile of the Regulators where they formed battle lines. Tryon sent ahead messages offering surrender terms while his militia marched slowly forward. When three hundred yards from the Regulators, they halted. The messengers returned to say that the Regulators had scornfully rejected surrender. Much time was then consumed in an attempt to exchange prisoners taken by both sides, but this effort failed. Tryon feared that the Regulators were stalling for time to improve their battle position and ordered his troops to draw closer. He then sent a final warning that he was ready to open fire. To this message the Regulators replied, “Fire, fire and be damned.” A barrage from the Governor’s artillery, consisting of six swivel guns and two brass field pieces, began the engagement and was the signal for concentrated musket fire from the militia ranks. The Regulators responded with volley after volley from their nondescript weapons. For half an hour they held their position in the open, then retreated to the protective covering of the woods at the edge of the clearing. For another hour and a half the battle raged, then the Regulator fire slackened. Tryon immediately ordered a charge and soon drove the Regulators from their positions. The fleeing frontiersmen were pursued half a mile. There Tryon halted his men and turned back toward the camp on Alamance Creek. Two wounded militiamen, as well as many of the wounded Regulators, were brought into camp and treated by the Governor’s physicians. Regulator losses were nine killed, upward of two hundred wounded and between twenty and thirty taken prisoner. Nine of Tryon’s men were killed and sixty-one wounded. On May 17 James Few, one of the captured Regulators, was hanged as an outlaw after refusing to take an oath of allegiance to the king. With the Battle of Alamance the Regulators were decisively crushed, but the effect of their campaign for reforms was embodied in the North Carolina Constitution. Newspapers throughout the colonies gave the battle wide publicity. In Boston and Philadelphia they cited the Regulators as martyrs and used their example to encourage the American cause on the eve of the Revolution.